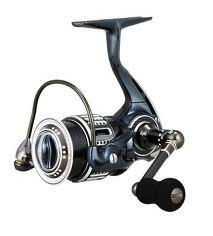 These amazing spinning reels deliver top of the line light weight handling and durability with stainless steel parts and a high end titanium carbon fiber and magnesium components. With a ten times more corrosion resistance, the near frictionless XCR ball bearing provides a force to be reckoned with. Ultra light weight magnesium body, side plate and rotor provide strength and toughness. This entry was posted on Saturday, October 8th, 2011 at 8:21 am	and is filed under Fishing Equipment, Fishing Reels, Spinning Reels, Tips. You can follow any responses to this entry through the RSS 2.0 feed. You can skip to the end and leave a response. Pinging is currently not allowed.